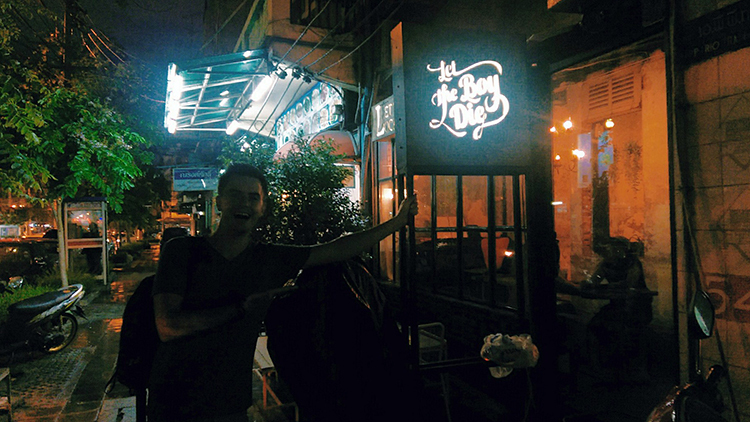 Silly Sir Brewing Co.The Thai Have Slightly Thicker Beer(ds) - Silly Sir Brewing Co.
Let the Boy Die is the name of a hidden craft beer oasis in Bangkok, Thailand. Its name, I'm told, is a homage to HBOs Game of Thrones series. The restaurant's trendy interior is deliberately rustic with dimmed incandescent bulbs dangling from the ceiling, line art painted on chipped cement walls, and exposed brick framing the draught tap wall. Were it not for its local, Thai customer base, the establishment could easily be mistaken for a hip, North American microbrewery. When we first arrived, there was only one table of white tourists enjoying pints by the taps (see picture below), and by the time we left, I was the only white person around. In fact, the bar seemed to be buzzing with Asian women, in fact I think there may have been more women than men on this particular night! Yo,Thailand! The beers on tap are all local Thai beers from various brewing companies. In researching the place I learned that the beers are rotated out quite frequently, and that the taps are ever changing. In fact, when we arrived, I snapped a picture that listed five beers on tap, and when I left two of those five beers had been rotated out and replaced, and a third was tapped and added to the menu. The menu rotates very quickly. The owner, Pieak Ska, is a friendly, trendy dude who brews all his beer (those listed as Three Coins) on a homebrew 5 gal. batch setup (perhaps this is why his lines are always changing). Since the establishment represented such a rare peek into Asian craft beer culture, I decided I should take the opportunity to give all the beers a shot, and review them in what shall henceforth be dubbed Silly Sir’s Pompous Snobbishism Report (SSPSR). Before I begin, it should be noted that several of these tastings were from tiny, sample cups, and so I wasn't really able to fully appreciate those beers. It would have been very expensive (and dangerous as I am quite the lightweight) to buy them all, especially since I'm on a shoestring budget. It may not be fair that I even reviewed them at all, so I'll make note of the “sample size” beers accordingly. Take those notes with a grain of salt. Appearance: light brown, and very hazy. Excellent creamy head retention, and lacing. Aroma: typical west coast hops. Very citrusy (predominantly orange) with pine. Taste: mirrors the citrusy aroma pretty closely. Medium to low bitterness for an IPA. Not much malt flavor going on, very slight toastiness. Mouthfeel: creamy texture, with medium-low carbonation. Overall: a solid, well rounded IPA whose aroma perfectly mirrors its taste. Appearance: very hazy, pale yellow. Medium head retention and lacing. Aroma: overall very muted. I've heard the word “horse blanket” thrown around to describe beer, and never really knew what it meant but I think this beer may have a slight horse blanket aroma to it. It's very earthy, and herbal. Aromas of corn bread, and yeast. Taste: slightly funky, and earthy with a real quick finish. Tortilla chips. Mouthfeel: medium carbonation, a little watery. Overall: an inoffensive, if a little underwhelming Kolsch. It doesn't have much body, and comes off a little thin. Not bad, and worth trying. Note: this was a tiny, sampler shot. Appearance: orange-brown, and very hazy. Medium head retention, and lacing. Aroma: pineapple, orangepeel, tropical. Very slight bubble gum. Taste: slight caramel (the maltiness of all the beers is really subdued), tropical fruits. Medium bitterness. Balanced sweetness, and quite delicious. Mouthfeel: medium carbonation. Creamy, lingering finish. Overall: solid, rounded, and robust beer. I would have enjoyed a bit more depth from the malts for the style. Note: this was a tiny sampler shot. Appearance: pale yellow, hazy. Excellent head retention and lacing. Taste: earthy, grainy cereal. Medium-low bitterness. Mouthfeel: finishes really quick, leaves you wanting more. Overall: a good, fresh and balanced standard pale ale. Appearance: hazy, medium-dark brown. Murky, with carbonation sticking to the sides. ½ m visibility or less (I just got my scuba certification on Koh Tao, Thailand ?). No head or lacing. Aroma: smells great! Chocolate birthday cake, pandan leaves, and coconut. Sweet. Taste: not so great. The chocolate tastes cheap, and the beer finishes slightly sour. Sight brunt coffee. Mouthfeel: a little flat, and lacking the robust creaminess I expect from chocolate stout. Overall: a sneaky beer. Looks unappealing, smells awesome, and doesn't taste good. Apparently it's only Pieak’s second iteration of this recipe. If you're reading, Pieak, I would suggest using some oats and black patent malt in your next iteration to improve the appearance and head retention, up the carbonation slightly. How did you go about bringing the chocolate notes? Appearance: light straw, and very hazy! Medium head retention and lacing. Aroma: earthy and herbal. Tree bark. Taste: earthy, herbal, and a little sour. Not a very “clean” Pilsner, and maybe not to style but I like it. Lingering finish. Mouthfeel: medium-low carbonation. Quite robust for a Pilsner. Overall: I quite liked this Pilsner. I usually think of Pilsners as rather floral, but this is not. Again, maybe not to style but if delicious nonetheless. Appearance: amber-orange, hazy, with excellent head retention and lacing. Aroma: citrus, grapefruit. Not much malt aroma. Taste: quite hoppy (bitter) without much maltiness coming through. Grapefruit comes through quite strong. Not really to style, but delicious. Mouthfeel: appropriate carbonation levels for the style, with a medium-length finish. Overall: Three Coins' best beer on taps (though in my opinion, not really to style). It lacks a bit in malt flavor and aroma, and is high in West Coast hops leading it into American Pale Ale territory. Very good. Overall, Let the Boy Die is a must-visit for beer aficionados looking for great beer in a region known for its sea of mass produced lagers. The selection is varied, and while the beers aren't always exactly to BJCP guidelines, are close enough and delicious nonetheless. *Whew*... we got through it! We treaded through the snobbishism and emerged relatively unscathed! While it can be tough to defend the knee-jerk silliness of describing beer, I'd argue that it can be quite useful in articulating what you like and dislike about your drinks. If you know what you like, you can seek out more if it. If you can't describe beer, you'll have a harder time finding a beer you enjoy. Most stouts, for example, have coffee and/or chocolate flavours to varying degrees. Some are even nutty. If you dislike chocolate (well, are you human?) but love coffee, you can ask your server about whether her stout fits your taste, and order accordingly. What some people don't realize (I didn't, initially) is that this process is entirely subjective, and that two people can pick up entirely different things when tasting beer. I once rolled my eyes at a documentary I watched on wine somaliers. I was put off when one of the guys confidently (and inaccurately) attempted to match a particular wine to a growing region in the world based solely its taste. His mistake was apparently quite a novice one, as the styles were nothing alike. Instead of laughing at himself, and owning the mistake, and accepting that his chosen path life was a teens-weensy bit silly, he insisted the wine bottles had been switched and that he was actually correct. The other two somaliers featured in the film were able to laugh at themselves, and actually made fewer mistakes because of it. I try and take beer seriously, but in a self-aware, and silly way. I'm no expert on beer styles (although I'm fairly familiar with some) but when it comes down to it the most important question to answer is, “do I like this beer?” If the answer is yes, great. Drink more of it. It ends there. If you however want to open yourself up the wonderful world of beer, in all its varied styles, I encourage you to take it a step further and consider why you like a certain beer. It's really easy, there's no right answer, and can be as simple as, “I like it because it's fruity!” As you explore fruity styles (there are many) you may discover other flavors and aromas in beer that you enjoy and that are linked to certain memories. Just as cilantro takes me to a forest, just as chai spice reminds me of autumn, and just as the scent of pine takes me back to memories of ancient Christmas celebrations. These links have all been conditioned into me, and are very real. Is it blasphemous to reveal that I love the taste of Molson Canadian adjunct lager as a craft beer lover? Bugger off. My association with it brings me back to summers on the lake with good friends. The more beer I drink, the more particular styles, or brands seem to transport me back to certain places or events. In other words, you can intentionally condition yourself. This can lead to a wonderful time warp that brings on the nostalgic smiles, if you let it. You just have to be patient. 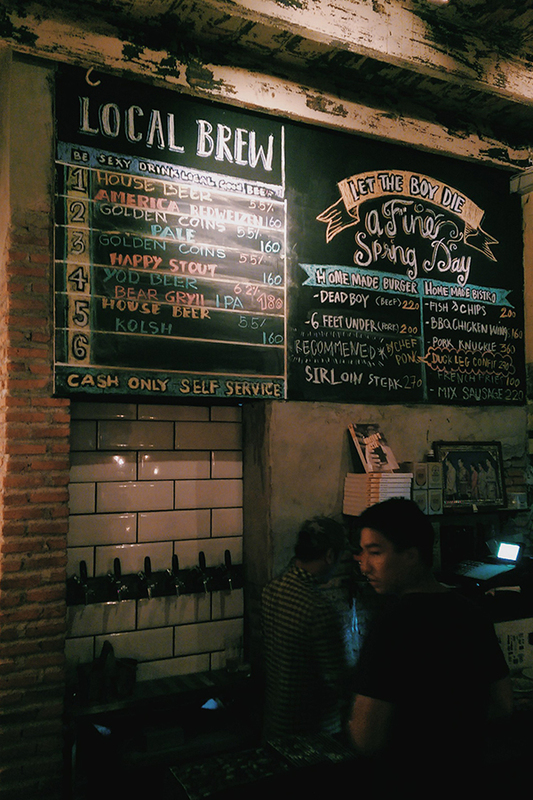 How have you found the Asian craft beer scene? Does describing beer make you somewhat uncomfortable as it does for me? Are there beers that you associate with different times or places?